NASSAU STREET PROMENADE: Strollers, bare trees, and windbreakers. It must be November. 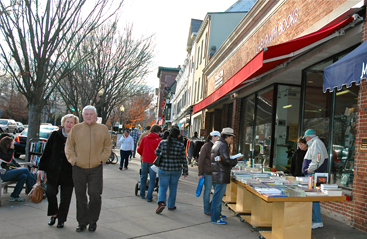 Sidewalk browsers at Labyrinth Books add to the Nassau Street Sunday afternoon ambience. Work on gathering data about Princeton Borough and Township in the interests of studying consolidation and shared services is moving ahead smoothly, with Anton Lahnston noting that the consultant, the Center for Governmental Resources (CGR), has completed over 40 first-round interviews. With talk about consolidation and sharing services looming large in local political discourse across the state, municipalities are considering new ways to combine forces and achieve efficiencies and savings. Enter police dispatch services. At its Monday evening meeting, Township Committee approved a License Agreement Extension with the School District to ensure that Corner House, TV 30, and the Townships Housing office can remain in the Valley Road Building through June 30, 2011. Over the past few months the Princeton Environmental Commission (PEC), a joint municipal advisory body, has been shifting its focus toward land use and land protection, according to Commission Chair Matthew Wasserman. Spirit of Community Awards were given to Debby DArcangelo, Donald Davis, Sacred Downing, Jose Hernandez, Cameron Hunt, Eric Maywar and Deborah Prendergast last week at Isless annual Harvest Dinner. Coming into the fall, the Princeton University team appeared to have the pieces in place to contend for the national championship. Customers who take their coats, pants, or dresses to Pristine Fine Dry Cleaning in the new building at 23 Spring Street will find another brand new opportunity at the same address: Concierge of Princeton.